Why: For us, Murder on the Orient Express felt a little bit like the board game Clue. Although, come to think about it, maybe Clue was modeled after similar murder mystery novels, in which case, Murder on the Orient Express has a feel much like Murder on the Orient Express... It should also be known that we’ve never actually completed a full game of Clue, which proves once again, we have no idea where we’re going with this opening... Sorry. Agatha Christie rules! This was our first experience with the queen of murder / mystery novels and the gal did not disappoint. 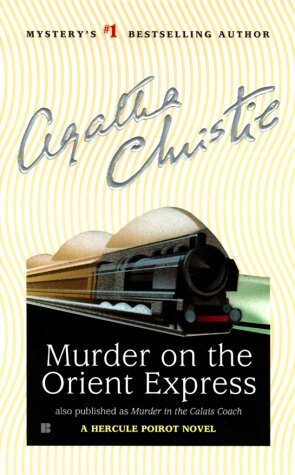 The story takes place on the Orient Express with internationally acclaimed detective, Hercule Poirot as one of the passengers. As you can probably guess, a murder eventually takes place in one of the first class passenger compartments. Dun-dun-dun, dun. Poirot and his legendary moustache are on the case at once, though it will take every ounce of their combined wit to identify the murderer. Murder on the Orient Express was thoroughly enjoyable. The personalities on the train are fantastic, none to be outdone by Mrs. Hubbard. The investigation was very structured and conducted in specific stages including personal interviews. It really allowed us to try and solve the mystery in real time. It should be noted however, that our guess was completely wrong when the veil was finally lifted (it turns out that neither Colonel Mustard or his candlestick were even on the train). Anyway, this is a great review, that makes me really want to pick it up! My favorite Christie novel is And Then There Were None. It's absolutely wonderful! It's so hard when you read a classic, because it seems so cliche, when in fact, that is where the cliche originated. I felt the same way the first time I watched Casablanca. I thought this was a fantastic read, not an extra word.